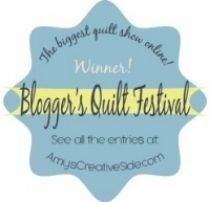 My Quilt Infatuation: A Milestone, and a Few Giveaways! 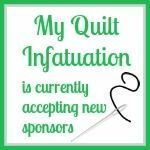 My blogging journey has been an amazing eight month whirlwind, and I just realized that My Quilt Infatuation has well surpassed the 1,000 reader mark! I've said it before and I'll say it again- I'm not into blogging for the "numbers game," so I'm not exactly sure when that even happened. Blogging is fulfilling for me for so many reasons- I am humbled by your support, thankful for your friendship, and inspired by your creative advice. These are the things that continue to fuel my own passion for writing, creating and connecting. I have grown more as a quilter in these last eight months, than I had in years before- and I am truly blessed. As a thank you to my readers, I have three different giveaways! 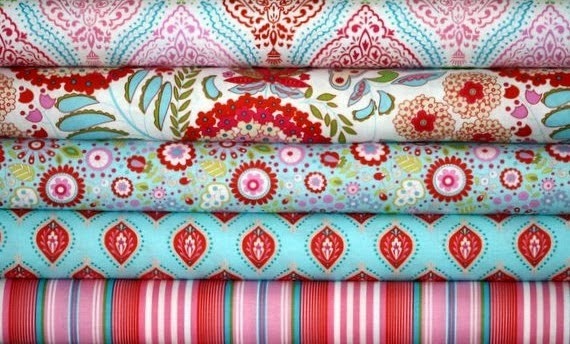 First up, Ginger from Five Monkey Fabrics is offering a fat quarter bundle of 5 prints in the Little Azalea line. Aren't they yummy?? Be sure to like Five Monkey Fabrics on facebook, follow on Twitter, or favorite on Etsy to enter this giveaway. You'll want to hear all of the news on the latest specials and sales! Secondly, provided by The Warm Company is a Queen Size (90x108 in.) Warm and Natural batting. If you've never used Warm and Natural, you simply MUST try it. This stuff is the best- hands down! 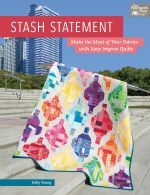 It has a fantastic weight that really gives an heirloom quality to your quilt. 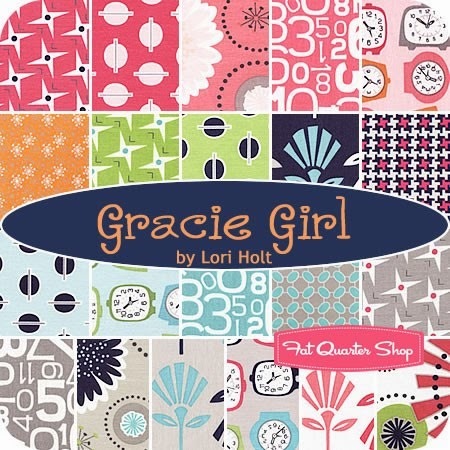 And last but not least, as a personal token of thanks, I am giving away a 7 inch stacker of Lori Holt's Gracie Girl from my own stash. These prints are so much fun! Since this is a thank you, I'm only opening these giveaways to my readers. Of course, if you'd like to become a new follower and enter- the more the merrier! You can find all of the appropriate buttons to help you do that on my right sidebar. I'm also happy to say that the giveaways are open to anyone in the wide world. So to all of my international friends- this one's for you too! To enter the giveaways, just leave a comment for me and let me know how you follow (only one entry per person, please). I'll use Mr. Random to choose all three winners on Wednesday afternoon, so I can announce them in next week's Needle and Thread Thursday party. *If you're a no-reply blogger or a wordpress user, be sure to leave an email address with your comment so I can contact you! Happy weekend, thanks again for the journey, and good luck! Edited- 2/5- The winners have been selected and can be found HERE! I follow from feedly. Love your blog. Congratulations Kelly on this milestone and, moreover, having such a consistently lovely blog! I follow you through Google, you're on my blog reading list in Blogger. Thanks for the wonderful giveaways! I am following you via Bloglovin'. Thanks for the chance... the prizes are awesome! Congratulations on your milestone! I always enjoy your creativity and love for quilting. I follow you on Bloglovin! Hi Kelly I have been following your inspiring blog with bloglovin! How wonderful and so generous! I follow via Bloglovin'. Congratulation on your milestone!! And thanks for the chance to win!! I follow you via email! Wow that is a wonderful giveaway! Congrats on reaching such a milestone. I love your blog and I follow you on Bloglovin'. I follow you on blogspot. I love seeing your new works, so thanks for the inspirations! I found your blog, I think, through crazy mom quilt's finish it up friday, several months ago. I follow through feedly. I always enjoy your posts and have shared your label tutorial with my daughter. Wow, Kelly! Congratulations. I follow your blog via Bloglovin. Thanks for your giveaways. Wow, that's a lot of readers in a short period of time! Kudos to you - I'm sure it's because of all your wonderful and pretty quilts that you show us! I follow your blog through bloglovin'. Congrats! I've been following you ever since the "Let's Get Acquainted" blog hop :) You always have so much inspiration. Thanks for the giveaway! I follow through Bloglovin. I am inspired by your creativity. Thanks for the chance at the giveaway. Thank you so much for hosting this giveaway! I love your blog...congratulations on your success! I follow you through blogger. Congrats on your milestone! I follow with Bloglovin. Kelly, I have been following you for a few weeks on Bloglovin. 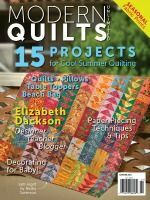 Really enjoy reading it, especially how you first started quilting. Wow! Congrats on the milestone. I follow you through blogger. Congrats! I follow you on bloglovin. Congrats Kelly! I follow on Bloglovin. HELLO! CONGRATS ON YOUR BLOG! HAPPY TO FOLLOW VIA BLOG LOVIN'! THANKS FOR SHARING A SWEET GIVEAWAY! Follow from bloglovin! Love to read your blog. Congrats! I have been follow with bloglovin. I've been following you on Bloglovin and love your style! I follow on Bloglovin. Love your inspiration! Congratulation on your milestone Kelly, and thank you for all the inspiration and fun you provide on your blog! I love to visit! I follow you via Bloglovin and I like Five Monkey fabrics on Facebook. All of your quilts are delightful. I especially love Bohemian Charm and Blossoms and Butterflies. You really know how to showcase beautiful fabric! Congratulations and Thank You for sharing your talent!!!! I have been happily following you with Bloglovin! Really enjoy this blog. Keep it up, I know that it is hard work to create such fab posts and I hope you do many many more. Ps. 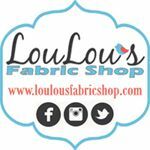 Would love to win the fabric! I'm a follower with Bloglovin'. Thanks. 1000 followers. That's a whole lot of people interested in what you have to say and receive inspiration from your thoughts. I'm one of them . Congratulations on your 1000 reader mark! I follow on Bloglovin. Thanks for the giveaway. I have been reading you for a while but have now signed up as a follower. I love your quilts! I follow your blog through Feedly! Thanks for the chance ~ fingers crossed! I follow you through Bloglovin. Thank you for the opportunity! I follow on bloglovin. I'm amazed that your blog has grown to 1,000 followers in just eight months. I think it's your personal touch. Each time I've posted to your Need n Thread Thursday you've viewed my post and left a comment. Thank you so much for that. I follow on bloglovin. Lots of inspirational ideas just keep me reading every week. Thanks for joining in the blogging world. Congrats Kelly! I follow your blog via email and just to make sure I don't miss anything, Bloglovin as well. Congratulations¡¡¡¡ And thanks for this giveaway. I follow you on bloglovin. Enjoy your blog...I follow via Bloglovin. Best wishes!! Congrats! I've enjoyed following your quilty journey. I follow on Bloglovin. Thanks for the chance on this giveaway! I loved you quilt label tutorial. I follow you on Bloglovin'. Congrats on your milestone! I am following via Bloglovin'. 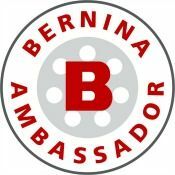 I follow via Bloglovin and love all the information you provide! Congrats!!!!! I follow via BL! I follow on bloglovin, and check your blog often! I am privileged to follow you on 'bloglovin'". What a great giveaway. Thank you Kelly, for the chance to win! Congrats! I follow with bloglovin! Warm and Natural is the best! Love your blog and would love to win this fabric. I have the perfect quilt in mind for my granddaughter with this fabric!! I follow on Bloglovin. Thanks for the chance to win such a wonderful giveaway! I follow you via Feedly... Thanks and congratulations! Kelly - you are doing great! I follow you via NetVibes. Congratulations! I follow you on bloglovin. Congratulations!! I follow you on bloglovin. What a sweet way to celebrate eight months blogging. I have your blog in my feedly. 8 months! Wow! I've been following since I learned about blogs - yours has been an inspiration and you really helped me get started with my own. I always enjoy your response, your willingness to converse. I'm amazed at how much you get done - and with a full-time job! Thanks for the NTT party! Always fun to link, look and learn. Congrats on hitting a huge milestone, I hope you celebrated with cake too. I follow with Bloglovin. Congratulations! I read your blog often via BLOGLOVIN and enjoy it very much! Thanks for all of the great giveaways! Congratulations Kelly on your amazing Blog. Many thanks for the giveaway! I followed on Wordpress Reader but have changed to Bloglovin! 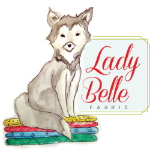 Wonderful post, great giveaway, awesome to find a new fabric shop, I am going right back to have a long look. OOPS, I forgot to say that I follow via Bloglovin, overwhelmed by the Five Monkey fabric. Kelly, I look forward to your posts every week. So inspiring and cheerful! I follow via email (I receive notification each time you publish) and your blog is really inspirational. I'm not surprised you have so many followers! Congrats! Eight months, that's amazing. I really enjoy your blog. Your "purse strings" is on my to do list. Thanks for the chance to win. Hi Kelly, that's amazing! Congrats! You know I love your work, have made 2 quilts using your tutorials...well the quilt tips at least. I follow through blogger and will add Five Monkey Fabrics to my Facebook! Thanks for the chance to win some beautiful fabrics! I follow you on bloglovin. Congrats on the milestone. I really enjoy reading your blog and find a lot of inspiration in your quilts. Hi, I follow on bloglovin. I enjoy NTT But usually wait til Friday to read it so I don't miss out on all the links. I am a blogloving stalker...oh I mean follower! Thanks for the giveaway and CONGRATULATIONS on your milestone!!! Congratulations on your milestone. As you can see we like reading your posts. I follow by email. I can't believe you've been blogging for less than a year - you already seem like a seasoned pro!! ;) Congratulations - I've loved following you through Bloglovin! Congratulations! That is quite the milestone! I follow by email. I follow you by email. Congratulations on this huge milestone. Thanks for the chance to win. I get your blog in my email -- that way I don't miss any. I enjoy what you share! Eight months already?! I have followed you since the beginning through email and as I have told you before - you are the first email I read every morning. You never cease to inspire me! If we ever get decent weather again I plan on sending you a pic of my latest quilt project that you heavily inspired! Keep up the fantastic blog and ideas. Wow time flies. I follow you on Bloglovin. I love that you just blog and not worry about that other stuff. I think that gives you time that I know you spend by visiting and encouraging other bloggers. I really think that is great. Thanks for the giveaways! I follow you by email. Have enjoyed your blog so much and your lovely quilt pictures too! I'm shocked to hear you have only been blogging for 8 months. I've been following you by email for months now, and I gotta say - you are a natural! Love love LOVE Lori's fabrics. Thanks for offering a giveaway! 1000 followers - good things happen when you're not looking, eh? Of course, having a great blog and following up to comment with everyone goes a long way toward keeping those followers. So happy for you! I follow with Bloglovin' and email. Here's cheers to your next 1,000!!! Hi, I follow by email, and bloglovin. I really look forward to reading your posts, they are always interesting and get me to be more creative. I follow by email! I love seeing My Quilt Infatuation in my inbox! I follow by email. I enjoy seeing all your lovely projects. Thanks for offering these great giveaways! congratulations on your milestone and more to come.I follow by email!! Congrats on your accomplishment! I enjoy your blog and can't wait to see more good things come. I follow by blog. How fun and congrats! I follow by email. Congrats!!! I enjoy following you on bloglovin! Congrats!!! I love your blog and follow on bloglovin too! I follow you in blogland :) I love the 'Gracie' squares! Absolutely gorgeous. Congrats to your eight months of having your blog. I agree - having our quilt blogs to interact with is like having a 'Show and Tell' day when we were in 1st grade! Bloggers are the best! Congratulations! I am an email follower. Congrats!!!! I follow you with Bloglovin!!! Congratulations! I'm a follower via email. I love your blog and follow through direct email. Congratulations on having so many happy readers following you! i follow on bloglovin' , love your blog. Congrats Kelly! 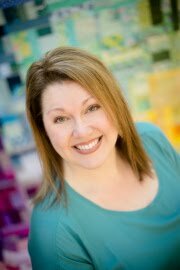 I've been following your blog via email since we met at the quilt guild meeting. You have been such an inspiration to me! And, as a beginning quilter (and new to sewing) your blog has taught me so much! Thanks for sharing your knowledge and photos of your beautiful quilts. Thanks for the chance to win!! I am a new follower via bloglovin! I am so happy I found your blog! Congratulations Kelly. I have followed your blog for quite some time. I am amazed at all the quilts you are able to get done. You give me lots of inspiration to get some quilts done, if I just had some time!! Kelly, you are an inspiration to me and I love reading and following your blog. I get you via direct email through Google+ and always look forward to seeing what you are up to. Thanks for offering us these very generous giveaways. Any of them would be a welcome gift. Hi Kelly, I've been following your blog for months now and really love to see all the work you've done. Thanks so much for the giveaway and Happy Quilting! Thanks for the giveaway. I follow your great blog through bloglovin. Congrats on a great milestone and thank you so much for a fabulous giveaway to celebrate. I happily follow via Bloglovin. Wow, thank you for such a generous give away! I follow by email. Wonderful prizes! Thanks so much for the giveaway. I first followed you via blogger, but now I have moved on over to bloglovin and follow you there as well. Congratulations! and what a wonderful give away. I follow you by email. I follow on feedly ... keeping my fingers crossed! Congrats on surpassing 1000! And all while you weren't looking! I follow you via bloglovin. Thanks for the opportunity to win! I follow via Bloglovin and enjoy reading your posts. Thanks for great giveaways. I follow by email; I enjoy seeing a new post from you and I click right away. I love the Warm & Natural batting. Quilts made with it wash up beautifully and you can iron it and throw it around without it breaking up like polyester batting would do. I tried one other brand of cotton batting and it turned out you had to quilt really close together, so the quilt was a mess when I washed it. Now I'll only use Warm & Natural. I had never heard of a "stacker" before, so today's blog taught me something. :) I usually get fat quarters or a lot of yardage. I would like to try a stacker! Thanks for the opportunity to win, and for the enjoyable blog posts! I follow you on Feedly. Just discovered you on Missouri Mel link. Thanks so much! I look forward to seeing future posts and exploring your blog. Congratulations! You are doing great! I am a follower. Follow on Bloglovin'. Really love your quilts - thanks for the inspiration! I follow via email. Congrats on passing the 1000 mark! Congratulations on passing 1,000 mark!!! Awesome!! Love reading and seeing your creations, follow via bloglovin'! I also follow Five Monkey Fabrics on Twitter and favorite them on Etsy (not sure if that is separate or not). 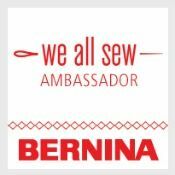 Congratulations on such a great milestone :-) I love reading your blog and follow on Bloglovin and FB! I follow through blog lovin. Congrats to you. I enjoy reading your posts through email. What a great giveaway, especially your stash! I'm surprised you can part with Gracie Girl ! Congrats on your 1000 reader! I follow on bloglovin. Keep going. I follow on Bloglovin. I've been following you for just a couple of months via email--I would never have guessed that you've only been blogging for 8 months! Your blog is very inspiring! Thanks for the lovely giveaway! Hi, I follow on feedly! New to the quilting world and loved your tutorial. I've been following you on Bloglovin for a few months. Great giveaway! Congratulations, Kelly! You have come a long way in 8 months! I've always loved your blog and now Five Monkeys is a favorite, too. Congrats on 1000 readers!! I follow on Bloglovin. Love that Gracie Girl! Thanks for the chance to win! Congrats on the growing following!! I follow through email and Bloglovin' both. Thanks so much for sharing!! I'm a brand new follower! So happy to have found you, you've got some gorgeous stuff over here. Congratulations on reaching 1,000 followers. I follow via email and I enjoy reading your posts. Thank you for the giveaway. I like 5 Monkey Fabrics on Facebook.